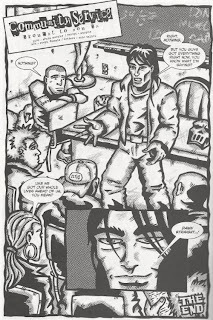 Talking to a class full of teenage ruffians, Casey lets them know that he used to run with a “gang” of his own until he cleaned up his act. Casey tells them about how he and “four brothers” used to pick fights with the Foot Clan, who were real dangerous back in the day. Furthermore, Casey insists that fighting in real life is nothing like in the movies. You can get hurt really bad or worse, you could lose your life altogether. He asks the students what that would leave them with. The students unanimously agree that they’d be left with nothing. Casey reminds them that at the moment, they have everything: Namely, their whole futures to look forward to. *Given Casey’s lesson, this story would take place after his retirement from the vigilante life. 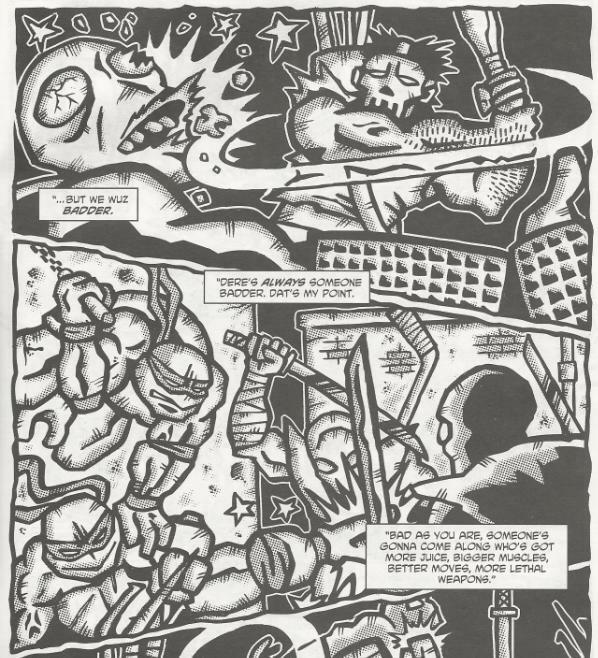 Personally, considering how the Foot Clan’s glory days are treated like a thing long past, I’d place it during the Mirage “Volume 3” era. 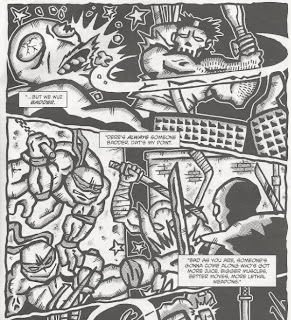 For some reason, this little 5-page vignette is one of the few from Tales of the TMNT Vol. 2 that really stuck in my memory. I mean, on the surface, it doesn’t seem very special, but I think it holds an important place in the narrative of Casey’s life. 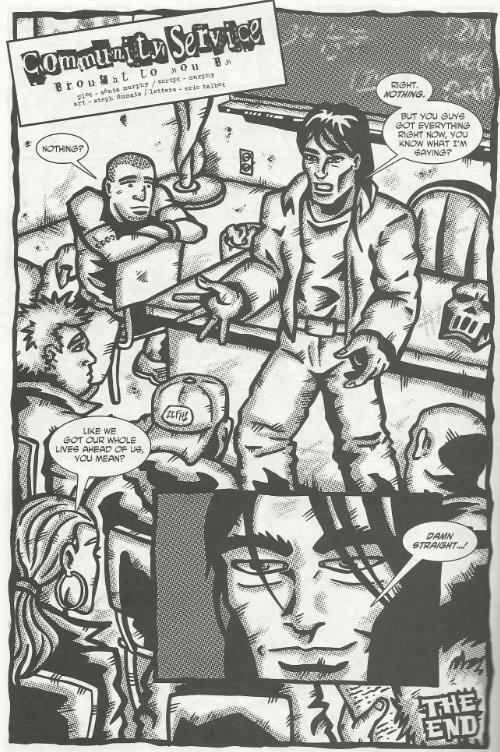 "Shades of Gray" and “City at War” offered a compelling reason for Casey to give up the vigilante lifestyle; and save for a few relapses under extreme circumstances, he never returned to it (until Vol. 4, but that’s in the future). What I like about “Community Service” is that it illustrates how much Casey has grown as an adult. Running around alleys and beating up thugs with hockey sticks wasn’t the solution, but even though he’s given up being a vigilante, Casey hasn’t given up on his inner drive to help the less fortunate and put an end to street crime. Here, he’s taking a preemptive strike against gang violence by trying to steer youths in the right direction before they make a huge mistake. He still cares, but he’s found a better way. Again, it’s a pleasant reminder that Casey is no longer the thuggish 20-something out for the thrill of spilling blood, but has outgrown that personality and put it behind him. It’s a small reminder, but we need it every once in a while. The script was written by Steve Murphy (based on a plot by Sonia Murphy), but Murphy weirdly messes with Casey’s speech pattern in ways he never has before. Casey's constantly dropping “dats” and “wuz” and “dese” and “dis”, and while he’s never been the most eloquent individual, the phonetic stylizing is a little much. Again, it’s not something Murphy’s ever really done with Casey (at least, not in such excess), making me wonder if Sonia Murphy actually wrote the script, too. Dumais’s pencils have an enjoyably stylized quality to them. They’re perhaps a little on the flat side, which can make reading the hectic and crazy layouts a challenge, but they work well for a 5-page short. From the context of the story, the first 4 pages are Casey’s memories, so the wildly exaggerated tone makes sense. Once we get to the classroom in the final page, the composition takes a reasonable perspective and looks much more down to Earth and readable. So I appreciate the method Dumais used. “Community Service” isn’t going to go down in TMNT history or anything and may get lost in the mix of other, more exciting and action-driven back-up strips, but I think it serves a subtle yet vital purpose. Take it and drop it somewhere during your Mirage read-through, preferably between TMNT Vol. 2 and TMNT Vol. 4. You’ll get a better sense of Casey’s growth as a person and he’ll feel all the more fully realized for it.